Lohri away from Punjab is not a Lohri et all for me. So this time around I was delighted at the prospect of spending the Lohri night at Smaaash and the newly opened Gurgaon Pub Exchange. Trade like a pro is the underline theme of Gurgaon Pub Exchange. 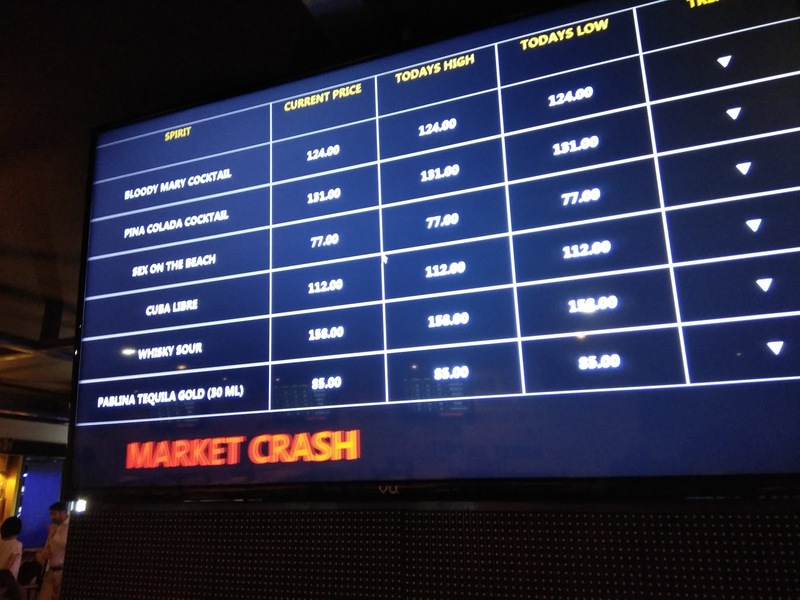 Like many other speculation driver bar exchanges in the city, Smaaash has got itself its own version of stock market like pub exchange. The place is tucked away at the back end of Smaash which is famous for its games. The bar has a comfortable and lounge setting with live music playing throughout the evening. TV screens adorn the walls of the place. 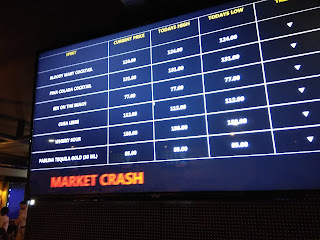 These show you the ticker, a live mechanism showing fluctuating prices of drinks and liquor based on demand. And as it often happens in the stock market, here too market crashed. So at times, when prices go very unstable, the market just crashes and rates are reset. The food is quite good and surprisingly I enjoyed the vegetarian fare better than the meat dishes. The Tempura stuffed mushrooms are a recommended try and their Dahi Kebabs are good too. Another dish, their cheese rolls are again very good. In meats, the Tandoori chicken came out well prepared. The chef has worked hard on getting a basic menu done just right. The desserts which I ate included a chocolate brownie with ice cream. Now that I was at Smaaash, also tried their arcade games and bowling which makes your leisure time relaxed and refreshed. Their signature game is cricket which I could not play as the waiting time was a whopping 2 hours. I had their winter special for dinner, saag makki ki roti with jaggery and lentils. A dhol played in the background with the DJ playing peppy Punjabi numbers. Followed by Gajar ka Halwa and chef special ladoos, the festival was made special by the Smaaash people. Gurgaon Pub Exchange is a recommended place for group gatherings where food and games can be mixed with good drinks.